The researchers were from Edinburgh and Glasgow universities. They looked at data from a lifelong study of almost 10,000 people from across the UK who were born in November 1958, known as the National Child Development Study. About a quarter of study participants had been in the scouts or guides. The researchers said their findings indicated that programmes that help children develop skills such as self-reliance and teamwork, and encourage being active outdoors, may have lifelong benefits. Attending the guides or scouts may help build resilience against common stresses in life, or it may increase a person's chances of achieving more in life, so that they are less likely to experience such stresses, the team suggested. Lead researcher Prof Chris Dibben, of the University of Edinburgh's School of Geosciences, said: "It is quite startling that this benefit is found in people so many years after they have attended guides or scouts. "We expect the same principles would apply to the scouts and guides of today and so, given the high costs of mental ill-health to individuals and society, a focus on voluntary youth programmes such as the guides and scouts might be very sensible." Prof Richard Mitchell, of the Centre for Research on Environment, Society and Health at the University of Glasgow, told BBC Radio's Good Morning Scotland programme that the same benefit was not evident from other types of volunteering. He said: "The results that we obtained showed that it did seem to be particular to scouts and guides. We didn't see the same protective effect from, for example, volunteering or from church groups. "And we think the reason for that is the structured nature of the activities that the scouts and guides do. "So, if you think about what happens at scouts and guides week in week out, you face new challenges. You learn to overcome those with the help of your friends, you acquire new skills. "You get used to overcoming unexpected situations and we think that's probably at the heart of the effect." 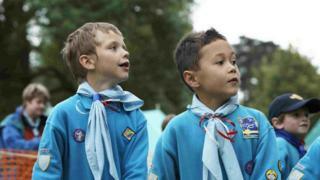 The findings were welcomed by the Scout Association and the Girlguiding organisation. Chief Scout Bear Grylls said: "I am really proud that scouting provides young people with an opportunity to develop the skills they need to be resilient and deal with what life throws at them." Tim Kidd, chief commissioner of the scouts in the UK, said being a scout had taught him skills for life. "I was never great at outdoor activities or a sportsman, but the scouts helped me find those types of skills," he said. "And it taught me about leadership and talking to people even though I was shy." Mr Kidd said the vital lessons were leadership and teamwork. "Whether it's climbing a mountain, going on a camp or perhaps just playing some games, all of these things help young people learn the skill of resilience," he said. Emma Brodey, 18, a member of the Girlguiding Advocate Panel, said: "Girlguiding is, and for over 100 years now has been, for the girl. "It offers a safe space where they can be themselves, build their confidence and escape from the ever-increasing pressures in their lives. "Women tell us every week that their accomplishments and memories through guiding have lasted throughout their lives, so it's amazing to see research showing the long-term benefits of being a member of Girlguiding." The Boy Scout organisation was founded by Sir Robert Baden-Powell in 1908, a few months after the first Brownsea Island Scout camp at Poole harbour in 1907, regarded as the start of the scout movement. Baden-Powell's ideas were influenced by his time with the Army in South Africa where he took an interest in reconnaissance work and woodcraft skills, and observed the work of a boys' cadet group during the Siege of Mafeking. In his book Scouting for Boys he set out his vision of outdoor activities developing character, citizenship, and personal fitness qualities among youth. Initially aimed at boys, it soon became clear that girls were also interested with a small group of "girl scouts" gatecrashing the 1909 Crystal Palace rally. Baden-Powell later formed the Girl Guides and asked his sister Agnes to look after the organisation. Young women were soon earning badges in sailing, aviation and home electrics - and made a contribution during World War One, growing food, acting as messengers or working in factories and hospitals. The Scout Association estimates more than 570,000 people are involved in scouting in the UK while more than 540,000 are involved in girlguiding.